This set of Hydraulic Machines Multiple Choice Questions & Answers (MCQs) focuses on “Degree of Reaction”. Explanation: The formation of vapour cavities is called cavitation. It is formed due to the presence of small free liquids with different zones. These zones consists of different layers of forces acting on them. 2. What is the degree of reaction denoted as? Explanation: Degree of reaction is defined as the ratio of the static pressure drop in the rotor to the static pressure drop in the stage. It can also be defined in the same way for enthalpy in different stages. It is denoted by the letter ‘R’. Explanation: Voids in a turbine or pump is created due to the presence of liquid free layers. It is formed due to the presence of small free liquids with different zones. These zones consists of different layers of forces acting on them. Explanation: Cavitation usually occurs due to the changes in pressure. The pressure change is so rapid that it leads to formation of liquid free layers or cavities that start to affect the overall performance. Explanation: Degree of reaction is most commonly used in turbomachinery. Degree of reaction is defined as the ratio of the static pressure drop in the rotor to the static pressure drop in the stage. It can also be defined in the same way for enthalpy in different stages. It is denoted by the letter ‘R’. Explanation: At high pressure, the voids can generate shock waves. Cavitation usually occurs due to the changes in pressure. The pressure change is so rapid that it leads to formation of liquid free layers or cavities that start to affect the overall performance. Explanation: Voids that implode near metal surface develops a cyclic stress. This happens mainly due to repeated implosion of voids. Thus, option ‘b’ is correct. Explanation: Degree of reaction in terms of gas turbines and compressors is defined as the ratio of isentropic enthalpic drop that is developed in the rotor such as the moving blades to that of the isentropic heat drop in the fixed blades. 9. Non- inertial cavitation is the one in which a bubble of fluid is forced to oscillate. Explanation: Non- inertial cavitation is the one in which a bubble of fluid is forced to oscillate. It oscillates in a different size or shape due to some form of energy called the acoustic field. Explanation: In a velocity triangle at the inlet and the outlet, the control volume is moving with a uniform velocity. Therefore, the momentum theorem of the control volume is at a steady flow. Thus, the efficiency of the vane is given by 1-(V22/ V12). Explanation: The velocity triangle represents various components. It mainly determines the velocities of fluids that act in a turbomachinery. It can be drawn for both inlet and outlet triangles with its angles. 12. Which among the following velocities cannot be found using the velocity triangle? Explanation: Hydrodynamic cavitation is due to the process of vaporisation. A bubble generation takes place in which implosion occurs during the flowing of liquid. Explanation: The process of bubble generation leads to high energy densities. The local temperatures and local pressures at this point last for a very short time. Thus, the option is ‘c’. 15. Super cavitation is the use of cavitation effect to create a bubble of steam inside a liquid. Explanation: Yes, it is true. Super cavitation is the use of cavitation effect to create a bubble of steam inside a liquid. It is large to encompass an object passing through the liquid to reduce skin friction drag. 16. Degree of reaction turbine is the ratio of? Explanation: Degree of reaction is defined to be the ratio of pressure and total energies inside the runner of a turbine. 17. Which of these options are best suited for the total energy change inside the runner per unit weight? 18. Which of these ratios are termed to be hydraulic efficiency? Explanation: From the equation of hydrodynamic machines, we get hydraulic efficiency to be the ratio of runner power and water power. 19. When a container containing a liquid is rotated, then due to centrifugal action, then which of these energies are changed? Explanation: When a container containing a liquid is rotated, then due to centrifugal action there is a change in pressure energy. 20. For an actual reaction turbine, what should be the angle beta, such that the loss of kinetic energy at the outlet is to be minimum? Explanation: Only when the angle beta is 90, V2 will be minimum so that loss of kinetic energy is minimized. Explanation: The discharge in a radial flow reaction turbine is the product of diameter, width and velocity of flow at inlet Vf1 with pi. 22. When the thicknesses of vanes are to be considered in the discharge of a turbine, what will be the area under consideration? Explanation: When the thicknesses of vanes are to be considered in the discharge of a turbine, and n is the number of vanes, are is given by Pi*d – n*t.
Explanation: The speed ratio is termed to be the ratio of tangential velocity at inlet to square root of 2gH. Explanation: Flow ratio is the ratio between velocities of flow at inlet to square root of 2gH. Here, H is the head of the turbine. 25. _________ means the angle made by absolute velocity with the tangent on the wheel is 90 degrees and the component of whirl velocity is zero. Explanation: Radial discharge is the angle made by absolute velocity with the tangent on the wheel is 90 degrees and the component of whirl velocity is zero. Radial discharge at outlet means the angle beta is 90. Explanation: For a Francis turbine, theoretically and practically, 0< R< 1. 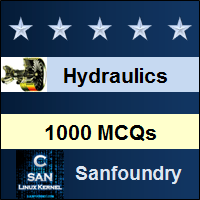 To practice all areas of Hydraulic Machines, here is complete set of 1000+ Multiple Choice Questions and Answers.